The American fashion industry loses one of its biggest and brightest stars. Legendary designer Oscar de la Renta has died at age 82, according to multiple reports. De la Renta was diagnosed with cancer in 2006 and said he was "totally clean" just last year. The official cause of death is not currently known. A family member confirmed his passing to ABC News on Monday night. Just one week ago, the brand appointed Peter Copping as its first creative director. "The only realities in life are that you are born, and that you die," De La Renta said in an interview with Fern Mallis at the 92Y in 2013. "You have to appreciate every single day that you&apos;re alive. Life is a little bit like a garden -- you have to find time to plant the seeds for beautiful flowers to grow. I&apos;m having a fantastic time. But I must say that I would have never been able to go through what I went through without my family and wife." 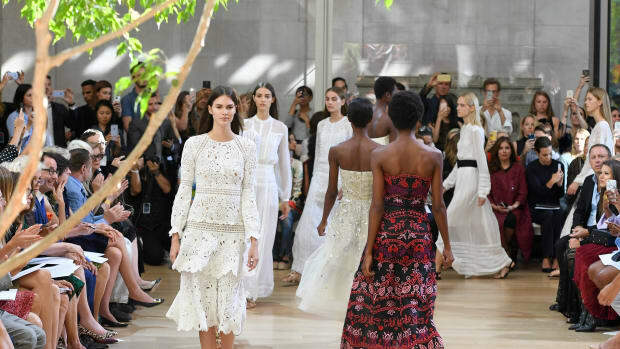 For more on Oscar de la Renta&apos;s career and legacy, click here. Erika Bearman, better known as @OscarPRGirl, tweeted a link to Oscar de la Renta&apos;s homepage. There, scanned and posted to the site, is a simple, handwritten note addressed to "Colleagues" from "Alex and Eliza" -- CEO and son-in-law Alex Bolen and stepdaughter Eliza Bolen. The note can be read in full below. For one, Peter Copping wasn't in attendance. Obama toasted the fashion industry at the White House on Wednesday.